The Auburn University Board of Trustees recently approved initiation of the second phase of a plan to renovate Samford Park. The plan calls for 30 live oak trees, grown from acorns taken from the iconic Auburn Oaks 12 years ago and now 15 feet tall, to be planted along a new brick walkway that will connect Samford Hall to Toomer's Corner. The university also announced that two large live oaks will be planted at the College Street and Magnolia Avenue intersection on Feb. 14, 2015, completing Phase I of the project. Although the exact species of trees that will replace Auburn's famed oaks has yet to be determined, the literal foundation for their survival is nearing completion at Toomer's Corner. The future oaks – scheduled for planting in early 2015 – will grow in a high-tech environment that will maximize their chances of living many years. 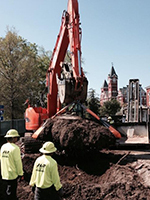 Following excavation and extensive testing, the soil around Samford Park at Toomer's Corner has been declared free of poison after more than three years. Click here for the latest update on the corner's remediation. 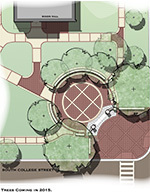 Phase I of the redevelopment and enhancement of Samford Park at Toomer's Corner is scheduled to begin Wedesday, April 2. In preparation for the work, the iconic eagles perched on top of the 1917 brick gates will be temporarily taken down Thursday morning, March 27, by The Lathan Company Inc., a Mobile-based firm which restored the eagles in April 2012. The eagles will be stored on campus and returned to the corner upon completion of the project. The gates will remain on site during construction. The project will begin with the installation of fencing around the perimeter of the worksite and the closure of a number of sidewalks in Samford Park as well as the crosswalks at the corner of West Magnolia Avenue and South College Street. 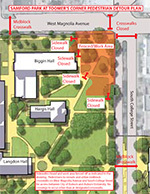 Pedestrians are asked to use the midblock crosswalks on West Magnolia Avenue and South College Street for access to the downtown area from the university. At times during construction, the right-hand, southbound lane on South College Street will be temporarily closed to accommodate construction traffic. Motorists are urged to use caution when traveling near the worksite. Phase I includes the installation of new pavers, soil replacement and a circular seating wall. This work is expected to be completed prior to the start of the fall 2014 semester. Phase I also includes the planting of new trees, which will take place in early 2015. J.A. Lett Construction Company Inc. of Auburn, Ala., was awarded the project on March 11, 2014. A pedestrian detour map is available here. A site rendering is available here. 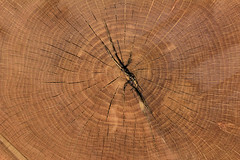 AUBURN UNIVERSITY - Growth rings from the base of Auburn University's College Street live oak at Toomer's Corner have revealed the tree's age of 83-85 years old at the time they were removed April 23. This week, two Auburn professors independently counted 81 growth rings in two directions from the center of the tree's trunk. "The center one-inch section of the trunk was split and not clearly delineated," said Professor of Horticulture Gary Keever. "This growth most likely occurred over two to four years, making the trees 83-85 years old." AUBURN UNIVERSITY – Auburn fans will soon have a way to remember the oaks at Toomer's Corner long after the trees are gone. To commemorate the tradition of rolling the oaks, the university will be working with several licensed manufacturers to create mementos from the trees' wood following their removal later this month. All royalties collected from their sale will benefit Auburn students through a special scholarship fund. AUBURN UNIVERSITY – After two years of extraordinary efforts to save the poisoned Auburn Oaks at Toomer's Corner, Auburn University plans to remove them on April 23, weather permitting. The final opportunity for fans to roll the beloved Auburn Oaks will follow the A-Day football game April 20 when the university and City of Auburn host a "Celebrate the Tradition" block party. AUBURN UNIVERSITY – Auburn University and the City of Auburn will host a "Celebrate the Tradition" block party at Toomer's Corner on Saturday, April 20. The event will be held after the A-Day football game and will give fans one final opportunity to roll and photograph the beloved oak trees before the trees are removed. A date for the trees' removal has not been set. "The Oaks at Toomer's Corner have been a part of Auburn tradition for generations," said Debbie Shaw, Auburn University vice president for alumni affairs and executive director of the Auburn Alumni Association. "Their removal will in no way diminish the Auburn Spirit, which has grown even stronger during these past two years." 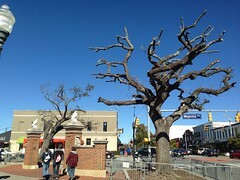 The Oaks at Toomer's Corner were damaged by fire early Sunday morning. Members of the Trees Task Force examined the trees Monday morning and found significant damage to both oaks and to several plants adjacent to the plaza. The Trees Task Force will post an update about the fire damage next week. The Auburn Police Division is investigating the incident. - Public workshops to be held Oct. 23 for landscaping and development suggestions regarding the area surrounding the Oaks at Toomer's Corner. Trees Task Force, team leader Gary Keever, Ph.D. Since our June update from the Trees Task Force, there has been nothing new to report regarding the health of the trees. They continue to defoliate and re-foliate, as expected when the pesticide tebuthiuron is applied. The prognosis for their survival, as described since we first learned of the poisoning, remains poor, and the university is continuing to monitor them, irrigate them, and collect and remove fallen leaves from the site to avoid contamination of other areas. It is likely that it will be at least spring 2012 – at the earliest – before we know if the trees will survive. Members of the task force from horticulture, forestry, and agronomy and soils are in agreement that rolling the trees is not harmful, and have advised university administration that if the rolling celebration continues, they be cleaned by hand, rather than with power hoses as in the past. The high pressure hoses can injure the trees by knocking off foliage, leaves and bark. We also recommend the barricades around the beds remain in place indefinitely. After months of reviewing options and obtaining input from the campus, the community and the team of horticultural, agronomy and soils, and forestry experts working to save the trees, Auburn University and the city will allow the tradition of rolling Toomer's Corner to continue, at least temporarily, this fall. At the recommendation of our experts, the university will no longer use high pressure hoses to clean the trees; they will be cleaned by hand. Many alternatives were carefully considered, including suspending the tradition or moving it elsewhere. Most of these options created new or additional concerns related to crowd control, traffic, safety issues for our fans and opposing teams' fans, easy access, community property, and the health of other landscaping and park-like areas. We ask our fans NOT to move the celebration into Samford Park, the beauty of which we are also trying to preserve, and where, with no concrete base to protect it, landscaping and vegetation is fragile. Enhance community-wide events, holidays, and gatherings year-round while improving the look and feel of the intersection overall. A steering committee will be formed to explore this option and set parameters for an architectural design contest, which would include involvement by members of the Auburn Family. More details will be announced in the coming weeks. Finally, hundreds of suggestions regarding replacement of the trees have been submitted by our fans and supporters, signifying their love of the university and its traditions. We have compiled these ideas and, if we determine the trees will not survive, which our experts say will likely not be possible until at least next spring, will review them at that time. The Toomer's Corner Oaks Task Force, represented by students, faculty, staff, City of Auburn officials and Auburn landscaping experts, is still considering "rolling" options for celebrating fans this fall. An announcement will be made later this summer once all options have been reviewed. NOTE/EXCERPT: WASHINGTON - A descendant of the Toomer's Corner oak trees will be planted on the grounds of the U.S. Capitol Friday morning, the idea of a Florida congressman who is a 1981 Auburn University alum. U.S. Rep. Dennis Ross, R-Fla., started the process of getting permission to plant the tree well before the original oaks were poisoned, but the attack gave the idea even more merit, he said. "That just made it more important that we get it done," Ross said Friday. The architect of the U.S. Capitol, plus House and Senate leaders, had to approve the tree's addition to the Capitol grounds. Although the oaks have become famous for their sports-related celebrations, he said it's Auburn's contributions as a land grant college he wants to honor. "It symbolizes the heritage that land grant institutions provide this country," Ross said. To read the complete article, go to this link. Results of water samples taken from underground wells in the area of the Toomers Oak trees returned from Data Analysis Technologies in Ohio showing only minor trace elements of Spike 80DF, the pesticide that was used to poison the trees. The levels found were well below what would cause a threat to public health or the environment. Tests were conducted as a precaution even though the water in the area beneath the trees is not tied to drinking water in the Auburn area. 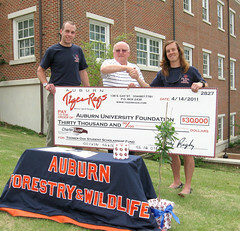 Jerry Rigby (center), president of Tiger Rags Inc., presented a $30,000 check Thursday to the Auburn University School of Forestry and Wildlife Sciences for student scholarships. Accepting the check were Ryan Mitchell (left), president of the Student Government Association in the School of Forestry and Wildlife Sciences, and Russell Agnew (right), Toomer's Corner Oaks coordinator for the school's Forestry Club. Tiger Rags created two special Auburn T-shirts following the news in February that the oaks at Toomer's Corner had been poisoned, with $8 of the proceeds from each shirt sold being donated to the scholarship fund. Additional donations will be made as more shirts are sold during the summer and upcoming football season. Tiger Rags has partnered with the School of Forestry and Wildlife Sciences since 2003 to raise money for student scholarships by selling seedlings from Auburn's famous Toomer's Corner Oaks. - Tide for Toomer's presents $50,000 check for Auburn's Toomer's Trees and Traditions Fund. - Dr. Stephen Enloe, an Auburn University professor of agronomy and a specialist with the Alabama Cooperative Extension System, is part of the Toomer's Corner Oaks Taskforce. You can hear an update from Dr. Enloe in this podcast.